To access your course Community page, click the 4 squares in the upper right corner of the platform, choose Course Intelligence, then Community from the left hand menu options. The Community tab is designed for you as a course owner or operator to manage your interactions with your course followers. You can view, comment, and like individual course followers posts, as well as manage your personal Course Feed, creating posts that followers of your course can see in their personal feeds. 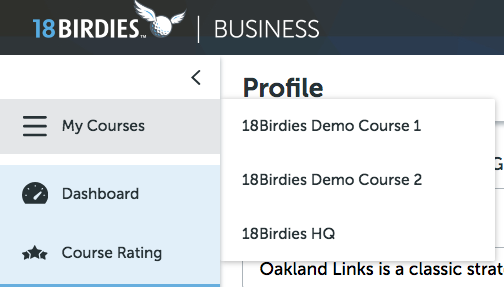 Note - If you are a multi-course operator and have more than one course connected to your 18Birdies for Business account, you can toggle between courses using the "My Course" link in the upper left corner of your screen. The Course Feed is your way to reach out and "touch" your course followers. You can use the feed to advertise sales in the golf shop, market tournaments or events at your facility, and much more. Be creative! Below is an example of a feed post from a golf course to it's followers. This one is advertising a sale in the golf shop. To do this, simply click the image icon to upload an image or video, and enter whatever text you'd like to go long with it, and tap Post. Here in the Golfer Posts tab is where you have visibility into all the posts that your group of course followers have posted to their personal feeds. 1. Followers - On the right side of your screen you can see all of your course followers. These followers could have joined your community by entering your course code upon downloading the app, or choosing to follow your course voluntarily. 2. Comment - In addition to being able to simply view all of your followers posts, you can comment on the post if you wish. For example, "Nice round Bobby, see you again soon!". Simply click the Write a comment... text in order to comment on the post. Also, you can click the Heart logo to view the 18Birdies app users that have 'liked' the post. 1. Multiple Course Segments - If you have more than one course at your facility (i.e. 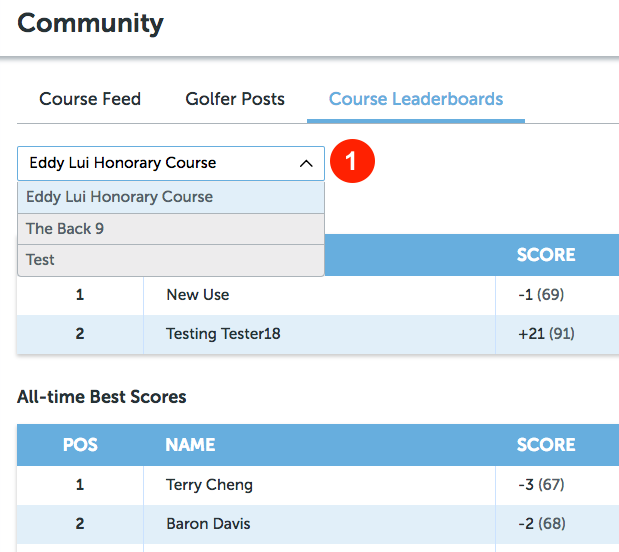 East and West courses), tap the drop down arrow shown in the picture below to toggle between course leaderboards.